There’s nothing more painful than being hit with a repair bill for your car that you didn’t see coming — especially when that large malfunction could have been detected before it ballooned into a sizable problem. Want to know the best way to protect your car against costly and unexpected repair bills? Take it to TransMedics for scheduled tune-ups and preventative maintenance services on a regular basis — your wallet will thank you! Better Gas Mileage – Why better gas mileage? Improvements in automotive technology are made practically every day. Tune-ups allow car owners to enjoy the benefits of cutting-edge technology, replacing old, worn-down parts with brand new components, such as spark plugs. Higher Resale Value – When the time comes to sell your vehicle, a car with a long history of preventative maintenance services can help you command a higher dollar figure or trade value. Strong Performance – It’s a fact: cars that are seen by mechanics with regularity perform better than those that don’t — it’s as simple as that. Warranty Protection – Many times, car manufacturers require tune-ups in order to keep a car under warranty. Ask about how we can help your vehicle stay under warranty! Commercial Clients: Ask About Tune-Ups for Your Automotive Fleet! 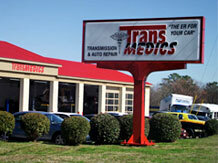 Tune-ups and preventative maintenance work from TransMedics isn’t limited to the individual car owner. TransMedics is also a trusted provider of fleet services to commercial customers. To find out more information, call our automotive specialists and technicians today at (919) 954-8699, or you may also request more information via our contact form. We are available to customers at our auto shop in Raleigh located at 5120 Old Wake Forest Road.